My mom is pretty sneaky. She made me this cake when I was a teenager. And I fell in love with it. Little did I know that there was a 'special' ingredient in it. She knows I have an aversion to eating anything green. She successfully hid this green vegetable in this cake. You can use a 12 cup bundt pan or two 8"x4" loaf pans with this recipe. First, peel and seed the zucchini. Then finely grate the zucchini. My Cuisinart food processor does a great job of quickly shredding! Not so fine that you get mush. Not so coarse that you can actually see the zucchini in the cake. Loosely measure 2 c. worth. Wanna have this cake during the winter? Put 2 c. of shredded zucchini in a freezer bag, flatten, and zip it up. Thaw and put it in a strainer and let it drain. Another great ingredient in this cake is buttermilk. I have discovered the SaCo buttermilk powder and love it! I just use 2 T. of this and 1/2 c. of water to equal 1/2 c. of fresh buttermilk. Let's take a close look at this cake. See how moist and chocolatety it is? Do you see any green things....strings....stuff? Nope. But it's there. Just don't tell any one! Finely shred your zucchini, which the secret ingredient that makes this cake so moist. You can measure your grated zucchini and put in freezer safe baggies for up to one year. Thaw out over night in the fridge, and you ready to enjoy this cake year round! 1. In a mixing bowl, beat the butter & shortening till light and creamy.2. Add the granulated sugar and mix well.3. Add eggs and vanilla extract.4. In a separate bowl, mix together the flour, baking powder, baking soda, salt, cocoa, and spices.5. Add the grated zucchini to the sugar mixture. Alternately add the buttermilk and flour till combined.6. Pour into a well greased and floured (or use granulated sugar) 12 cup bundt pan*.7. In a small bowl, mix the chocolate chips and 2 T. of granulated sugar. Sprinkle evenly on top of the cake batter. 8. At the end of the cook time, turn the pressure cooker OFF and allow a full natural release. 9. Bake in a 325°F preheated oven for 50-55 minutes of until a toothpick inserted in the center comes out clean. *Can use two 8"x4" loaf pans. Looks good! I love baking with buttermilk! I love zucchini bread. I'm sure your cake is terrific. I made and posted about making your rosette hamburger buns. Thanks for sharing your technique! I ran out of buttermilk powder! Nooooooo! 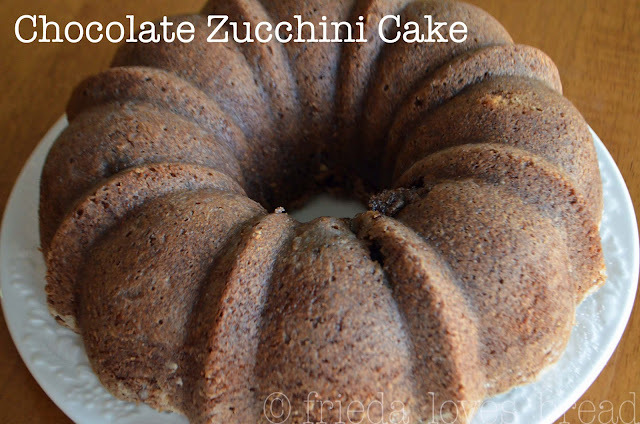 I MUST sneak my kiddos some zucchini this way...brilliant mama :D This looks so moist and inviting! This cake looks delicious. Now to see if someone will gift me a zucchini to make this dish. I'm happy to report that a good friend of mine made this recipe and said it was soooo yummy! This is a moist, rich cake that doesn't need frosting! Sophie, courgettes? Never heard that before...that's what I love about blogging...I'm learning something new daily!